In today’s information-saturated society, there is no shortage of sources or ways to get to them. In the not-so-distant past, researchers often had to travel to libraries or depositories to retrieve sources on-site; now, much of this information is available electronically, and the next few years we’ll continue to see a manifold increase in the kinds of sources we can access online. It’s an exciting time of transition, and a great time to be a student! When I was first a college lad, back in the fall of 1985 (What a geezer! Can’t you just see my long white beard and stooped shoulders? ), libraries still used ancient tools called card catalogs. Our facility at Illinois Wesleyan University had a couple of computers over in a corner, but they were just starting to get the book catalog online, and the computers were next to useless if you wanted to get something done. We’ve come a ways in 25+ years! A few remarks about the two primary ways you’ll retrieve sources as an undergraduate researcher at Roosevelt: the library and the world wide web. At this point in the information revolution, you need to be comfortable using both tools, for they each have their respective uses, strengths, and conveniences. And unlike back in the 1990s, these two research tools are not completely distinct anymore, for much of the modern university library is electronic-based. Has the advent of the web made the traditional academic library obsolete? Thankfully, no. If anything, the library is more important (and useful) than ever, because it’s a repository of organized, catalogued, and highly retrievable information geared toward scholars (if it’s a university library, that is), while the web is still a comparatively chaotic and confusing place (more on that later). In fact, the library as research facility has adapted to new informational technologies quite nicely and effectively uses online tools to help scholars find sources. I-Share: Electronic (now web-based) card catalog for finding books at RU, searching the stacks of over 60 college and university libraries across the state, and ordering interlibrary loans. Lib Guides: These are amazingly useful webpages developed by RU instructional librarians to assist students doing research in particular subjects. The Lib Guide collects relevant books, databases, reference works, and even websites so you can streamline your research process and make it more efficiently. Highly recommended! Note, for example, the Sustainability Lib Guide I use for my SUST courses. One thing to note about the journal databases is that some of them (like First Search) are actually collections of many different databases, each of which can look for different types of articles. Often these different databases are organized by subject areas, which can be really handy for focusing in on a topic. Additionally, each of the databases works slightly differently, which means you have to spend a little bit of time getting used to the capabilities and limitations of each database. Along with reference works (specialized encyclopedias, dictionaries, concordances, bibliographies, and other tools) which can give you a broad overview of a given topic, books and journal articles are two of the most important sources you can tap into as a researcher, for the simple reason that most respectable scholarship appears in book and/or journal form. So how do you tap into these riches if you’re an online or commuting student and don’t have easy access to the library facility? Easy. 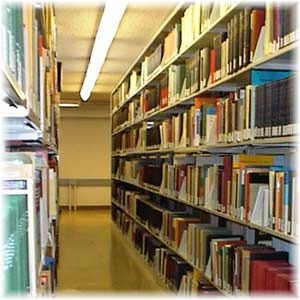 The vast majority of materials in the RU library are searchable online, including books and journal articles. Thus, most of your searching can be done from your own computer, although a few databases are only available in the library. You still must come to the library to pick up books, but you can have a book delivered to either RU campus. As for journal articles, many are available now in full-text format, which is the epitome of convenience. Others must be retrieved in person at the library; still others (from journals the library doesn’t own) can be ordered via interlibrary loan. For details on how to use the Roosevelt library as well as these specific databases, spend some time working through the library’s online tutorial. From the tutorial page, look through the sections on how to use the library and its services, how to search for books, and how to search for journal articles. Note that the RU library is easily accessible via a tab link within RUOnline, as well as from the university’s homepage. A final word about our library: Don’t underestimate the value and power of a university library, even one as modest in size as Roosevelt’s. Compared to community libraries (with the exception of the really good ones, like the Chicago Public Library), university libraries have far more extensive collections, deeper interlibrary loan networks, more scholarly works of all kinds, and more powerful and sophisticated databases. Even if you recognize the same database (e.g., Infotrac, Lexis-Nexis) that you’ve used at a public library, Roosevelt’s version is the “hyped up” edition only available to colleges and universities. So use your library . . . it’s a powerful resource! Most of you are pretty familiar with the joys and pitfalls of retrieving information via the web. As a scholar and teacher, I consider the web to be an absolutely invaluable resource, but I think of it as a complementary tool to the academic library. While the amount and diversity of information on the web has increased exponentially the last few years (and should continue to do so), searching the web is still a time-consuming and rather inefficient chore: even when using quality search engines, such as Google or AltaVista, you may have to sift through dozens of irrelevant “hits” to find the information you want. Doing this requires a couple of key things: identifying the source (figuring out what the heck it is) and then evaluating its quality and relevance. The range and diversity of things on the web at this point is beyond staggering. It’s common knowledge that you can find everything from complete novels to candidates’ political profiles to marketing pages for companies to government-sponsored reports to university department pages to tribute sites for guinea pigs authored by animal-loving 13-year-olds. It’s all there, in a parallel universe of people, ideas, and information. So how do we sort through this information, identify what a given site is, and evaluate its quality? There’s lots of good stuff on the web, but there’s also plenty of garbage, and all sorts of things in between; some sources are reliable and thorough, some have shaky credibility, and some are downright crazy. How to make sense of this cacophony? Evaluating Web Resources, developed by library professionals Jan Alexander and Marsha Ann Tate at Widener University. Explains each of the 5 kinds of web sources, provides links to examples of each type, and lists evaluative questions for each type of source according to specific criteria: authority, accuracy, objectivity, currency, and coverage. A Guide to Critical Thinking about What You See on the Web by John Henderson of Ithaca College. Full of humor and insight, this site provides a simple yet thorough approach to assessing web pages. Regardless of the specific way you approach a web source, the key thing to remember is that you’re trying to determine the quality of the source (how good is the information?) as well as its credibility (how much can I trust the information?). The better answers you supply for each of the following criteria with respect to a given web source, the greater the quality and credibility of that source. But what about other kinds of sources, including books, professional journal articles, news and popular magazine sources, reference works, government documents, etc.? These are probably even more important than web sources, given the vast amounts of information available in print and the higher levels of quality control (not always, but generally) that surround the production of print sources compared to that of web sources (often there’s no editing or quality control for websites beyond what the author provides). It’s important to analyze that information, too, in order to assess the quality, credibility, and usefulness of a given source for your research. Peer-reviewed sources are better than non-peer-reviewed. University Presses are good sources of scholarly books and even journals. These books tend to be more scholarly in nature than those you’ll find offered by trade publishers. Scholarly and professional journals are excellent sources of original, peer-reviewed research reports. For some critical questions to apply to sources you find in the course of your research, check out this brief list of questions from Purdue’s Online Writing Lab. Remember that you should also evaluate a source as you read it, before you use it in a research paper.